Among the storied waters of Oregon, the Yamhill River garners faint praise. In Oregon people speak of the Rogue, Santiam, Deschutes and the Owyhee in a reverent way. We speak of our last adrenalin pumping run through Blossom Bar on the Rogue and the haunting, otherworldly landscape of the Owyhee, a river that can be run only a few months a year but which captures your imagination for a lifetime. In my backyard of McMinnville, meanders the Yamhill River which serves as a functional workhorse for local farmers to irrigate the crops. 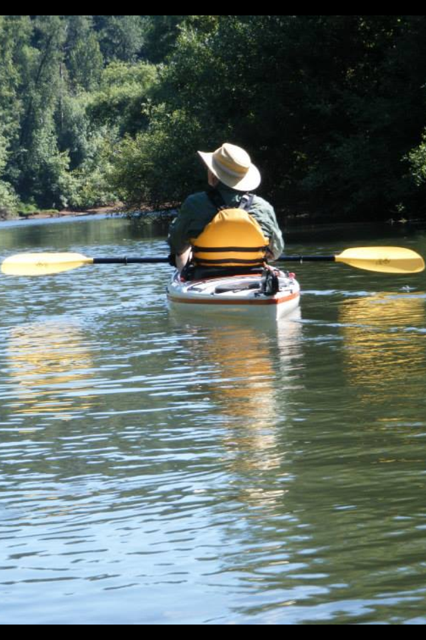 I’ve lived along the Yamhill for many years and have never been on the water. It is slow-moving, filled with chemicals from neighboring farm run off and often muddy during the rainy season. In many ways the Yamhill is a hard used and often polluted waterway. This past week I purchased a kayak. I’ve long borrowed or rented and finally I’d bought my own. It is a 14′ kevlar coated beauty designed to glide along lakes, wide rivers and ocean estuaries. Yesterday I went on the water with my friend David who has a lovely, hand-built wooden kayak. We only had a few hours and he took me to ‘one of his favorite rivers’, the Yamhill. I decided to put my doubts aside and trust David’s recommendation. We slid our kayaks into the river at the Dayton Landing. What I discovered was a beautiful stretch of water. For the next few hours we had the river to ourselves with the exception of Great Blue Herons, hawks, falcons, butterflies and jumping fish. I discovered that the river I’d ignored for the last 20 years offered beauty both subtle and dramatic. Beauty that I had thought could only to be found elsewhere. As I took my new kayak out from the water I knew that David had introduced me to a river with many stories to tell and gifts to offer. The Yamhill River put-in is only 15 minutes from my door. Beauty and adventure await. Who knew? Sometimes it takes a person to show us the beauty of God’s creation, since we seem so busy or distracted. Thank God for friends! Kent, SO HAPPY to read this. The Yamhill River has been in my thoughts in a very compelling way. Not only have I been wondering the best way to get my little rowboat boat onto the Yamhill, but I’ve also been thinking about how we in YC might be moving more insistently into protecting this piece of paradise. Thank you.